Adrenal Gland - Its Layers and Hormones - Hormones secreted by different layers of Adrenal Gland. 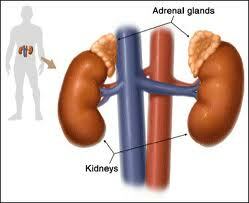 Adrenal Glands are two in number and each one is located on the antero-superior aspect of each kidney. Adrenal gland is an important gland of the body which secretes many important hormones which control various important functions of the human body. When we cut adrenal gland cross-sectionally we see two distinct regions. The outer one is called Cortex and the inner zone is called medulla. Each zone consists of different cells which secretes different hormones. The Cortex is further divided in to three layers. and the inner most layer is called zona reticularis. 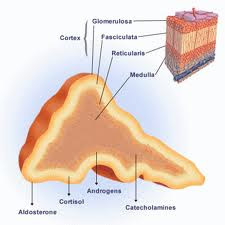 Adrenal cortical hormones secretion is controlled by the level of ACTH (adrenocortico-trophic hormone). ACTH is secreted by pituitary gland. following hormones are secreted by different zones of adrenal gland. Zona glomerulosa secretes minrelo-corticoids especially Aldosterone - Aldosterone controls blood volume and blood pressure. it is involved in haemodynamics. Zona fasciculata secretes glucocorticoids. The most important one is called cortisol. Cortisol is involved in stress and it is an impotant hormone in managing stress. Zona reticularis secretes Androgens. These hormones are responsible for development of sexual Characteristics. Adrenal medulla secretes two important hormones, epinephrine and nor epinephrine. these are also called adrenaline (epinephrine) and non-adrenaline (nor epinephrine). These hormones help to fight with the stressful condition, control blood pressure, increase heart rate, effect body metabolism and various other functions.